Most American readers will recognize the name Eduardo Risso from his amazing work on 100 Bullets. Now, don’t get me wrong, I am a fan of 100 Bullets – I own all of the trades – but what you should also know Risso from is his work with Carlos Trillo on books like Chicanos and the book we’ll discuss in this post, Borderline. Chicanos is an amazingly intimate book about a woman and her life in a barrio outside the United States. It’s a wonderful book that I hope to have time to discuss later in another post. Today, I want to implore you to read Boarderline. In many ways, Borderline is nothing like Chicanos. However, in other ways, it’s a very similar book. 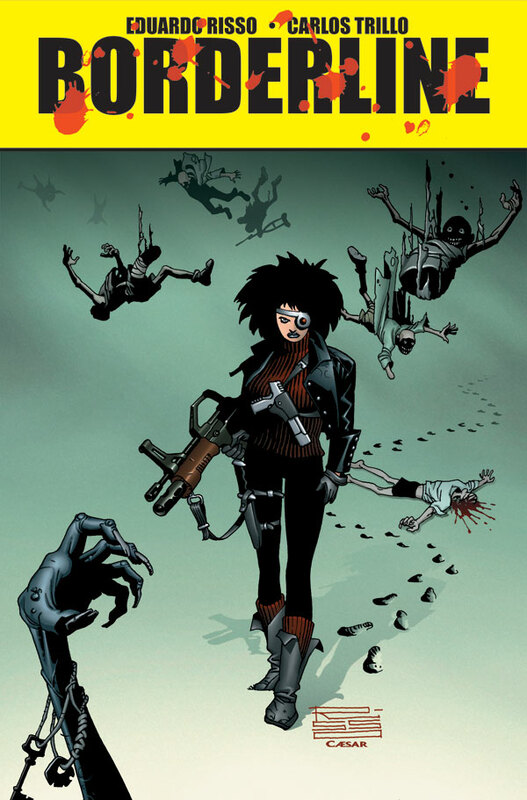 Most of Borderline tells the story of Lisa, AKA Crash, a deaf/mute warrior in a dystopian future full of guns and political intrigue. The guns are of course just fun violence but the political intrigue and conversations are as much about metaphorical social discourse as they are about witty banter between incestual twins. As you can tell, the book is a little crazy. But a good crazy. Oh and it’s beautiful. Risso really displays his mastery of positive and negative space with Borderline. He “only” has black and white to play with but for the purposes of this book, he really doesn’t need anything more. Risso’s use of black and white establishes the visuals of a dark and gritty world where Trillo’s extreme but not completely unfamiliar analysis of difficult cultures can flourish. Now that I’ve read 4 volumes of Borderline, I genuinely wish there were more. But I guess this just means I’ll have to find their other books like Vampire Boy. This entry was posted in Columns and tagged argentino comic books, borderline, carlos trillo, chicanos, eduardo risso, indie comics, vampire boy. Bookmark the permalink. Follow any comments here with the RSS feed for this post. Post a comment or leave a trackback: Trackback URL.